Harssh Poddar, a senior police official, addresses a village meeting at a rural school near Malegaon, in northern Maharashtra state. He warns families to be skeptical of what they read online. Earlier this month, Poddar helped rescue five people from being killed by a mob in his constituency. 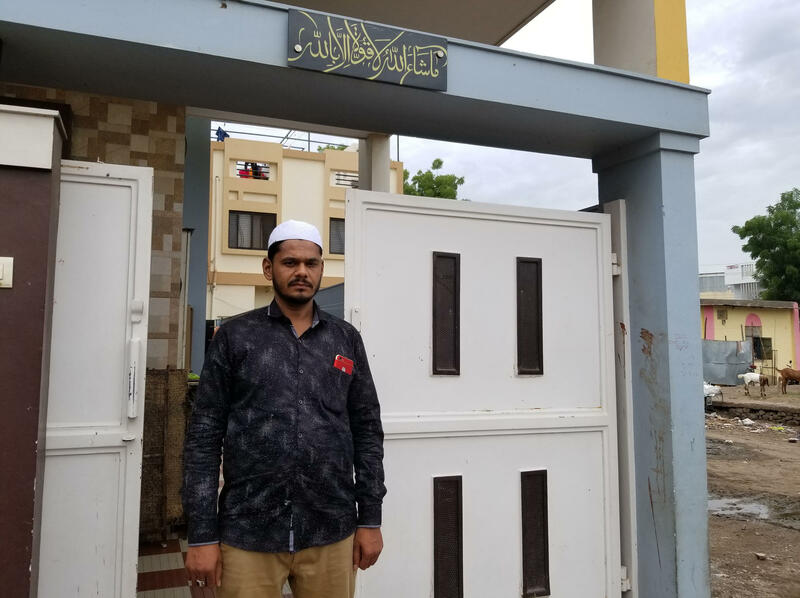 Shaikh Wasim Shaikh Karim, 32, rescued five people from an angry mob in front of his home earlier this month. He pulled the victims — a couple, their toddler and two relatives — to safety behind this gate, as the mob shattered his windows with stones. "When my children go outside to play, I'm really scared," she says in an interview at her home in western India. "These rumors have been spreading. I don't let them walk to school alone anymore." In recent months, about two dozen people across India have been lynched — beaten to death — by mobs driven to violence by what they've read on social media. Fake news is blamed for misleading voters and possibly influencing elections in the West. But in India, it's killing people. One night this month, around 11 p.m., Sabah heard a commotion outside her home. She lives in a midsize town, Malegaon, in northern Maharashtra state — an area famous for its textile looms, about 170 miles northeast and inland from India's largest city, Mumbai. She was inside, having put her children, ages 4 and 6, to bed. Her husband was outside tinkering with his motorcycle. "I saw a mob beating five people. The crowd was getting bigger and bigger. They filled up the road in front of my house," says Sabah's husband, Shaikh Wasim Shaikh Karim, 32. "They even attacked police vehicles." The five victims at the center of the mob were a couple, their toddler and two relatives. They'd wandered into town to beg, police and witnesses said. Locals feared they were the kidnappers all these WhatsApp messages had warned of — and attacked them. Shaikh Karim pulled the victims to safety inside his home, as the mob shattered his windows with stones. Police finally intervened and extracted them. But they're still in hiding, shaken. 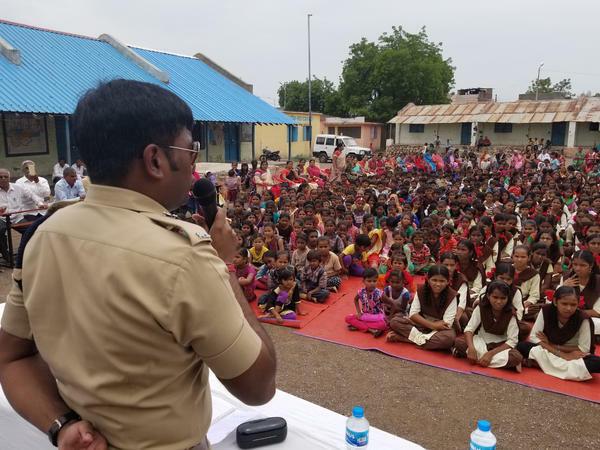 "We made an appeal to the families, that they should not be fooled by false rumors and false pieces of news on the Internet," says Harssh Poddar, additional superintendent of the Malegaon police. "They must use their own minds. They must use their own sense of discretion — and in any case, it is not legitimate to attack someone on the belief of any rumor, fake or true." The problem of mob justice in India isn't confined to poor people, or rural dwellers, or first-time smartphone users. One of the latest victims was an engineer for Google. In May, another man was killed under a highway flyover in Bangalore, a city of 12 million that has become India's high-tech hub — the local equivalent of Silicon Valley. Many of the rumors circulating India prey on people's deepest fears, like having your child stolen. Some of the messages blame a rival religious, ethnic or tribal group — stirring a mistrust that already exists deep down in certain communities, Poddar says. "I wouldn't say that when a mob behaves like this, that it is an incident of collective losing of mind. It isn't," he says. "It is an instance of knowing that you are shielded behind a crowd, that you may not be identified, and therefore you can indulge in behavior that is otherwise unacceptable in any civilized society." Poddar is trying to change that. He's used closed-circuit TV to identify attackers. He's threatening jail time to anyone who even forwards incendiary messages. The Indian government has demanded that WhatsApp block such messages. The company responded with new features, including a label on content that has been forwarded. "We're launching a test to limit forwarding that will apply to everyone using WhatsApp," the company said on Thursday. Inside India, another new feature will prevent users from forwarding messages to more than five people or groups at a time. The app will also remove a quick forward button next to media messages, it said. "Right now the most important point is to tell people that WhatsApp is not your news source," says Pankaj Jain, who runs the Hoax Slayer website, devoted to debunking fake news online. "It's not a newspaper, it's not a news channel." Jain says he receives 20 to 30 queries a day from the public, urging him to investigate rumors or suspicious videos online. He has debunked mermaid sightings, ghost cars and, increasingly in India, kidnapping videos. He traced some of the most incendiary footage to an unrelated incident in Guatemala, not India. With smartphones and Web service getting cheaper and more ubiquitous in India, Jain says online rumors are multiplying. He predicts it'll grow even more next year. "Whenever an election comes, the fake news starts spreading a lot," Jain says. "So obviously it's going to increase by 2019." NPR Mumbai producer Sushmita Pathak contributed to this report.